Fort Delaware (1847-1944) - A Third System coastal masonry fort on Pea Patch Island, New Castle County, Delaware. Established on the site of previous fortifications in 1847 and construction continued until 1859. First garrisoned in 1861 at the beginning of the U.S. Civil War by Federal troops, it remained garrisoned until 1870 when the fort was deactivated. The fort was reactivated during the Spanish American War, World War I and World War II. Finally deactivated in 1944. Part of the Harbor Defense of the Delaware. Established on Pea Patch Island to protect the entrance to the Delaware River. The first fortification on the site was an earthwork fort built in 1813 and dismantled in 1821. A second "star fort" was built starting in 1819, and it burned on 8-9 Feb 1831. It was made of sandstone (brownstone) and wooden interior. When it was torn down in 1833, the stone was used to reenforce the sea wall. 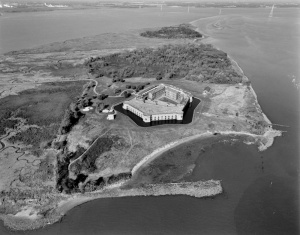 A dispute between the State of Delaware and the State of New Jersey over the Island was settled and in 1847 Congress appropriated one million dollars for the construction of a Third System masonry fort on Pea Patch Island. 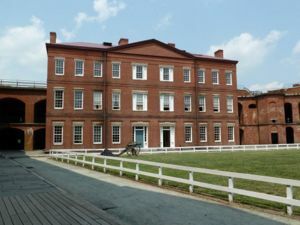 During the U.S. Civil War the fort served as a prison for Confederate prisoners of war. The prison population varied from about 200 in 1861 to about 11,500 in 1863. Conditions varied and while there were outbreaks of smallpox and cholera the overall monthly death rate was a low 1-2%. As many as 331 prisoners died of cholera in a single month and by war's end over 2,900 Confederate prisoners had died on the island. New research by Fort Delaware Society archivist Jocelyn P. Jamison compiled the names of 2,925 Confederate prisoners of war using the fort’s record books from NARA. In addition, there were 109 Union guards [26 others are still unknown], and 39 civilian detainees who died at the Fort. For more detail see Finns Point National Cemetery and They Died at Fort Delaware 1861-1865. 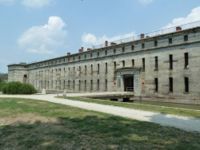 Despite the large number of deaths, the prison at Fort Delaware had one of the lowest death percentages (10%) of any U.S. Civil War prison. The post built a 600 bed hospital that was tended by at least four doctors during the war, and possibly up to ten. The engineering department had their own doctor, as did the infantry unit. A dozen confederate surgeons even are documented as voluntarily working in the hospital. This hospital was designed by Philadelphia architect John McArthur Jr., then considered a world-known architect. Absent epidemics, the majority of prisoners formed messes, ran businesses, and lived life as normal. 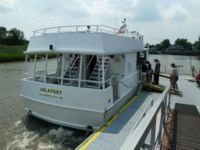 The general even was allotted a ship which pumped fresh water from the nearby Brandywine river and brought to the island. The official records show that Fort Delaware was the POW camp that had the most packages sent to prisoners. It was also more socially acceptable for pow to accept "aid" from the rich elitist living in Delaware, Maryland, and PA. Records also show the commandants requesting clothing, and blankets for the POWs. This fort, like all the other Third System Forts was made obsolete by the adoption of large caliber rifled cannon that could penetrate the brick and masonry walls. The destruction of Fort Pulaski by Union batteries in Apr 1862 signaled the demise of the Third System Forts. After the war the fort was allowed to deteriorate and many of its buildings and other structures were torn down and sold for scrap. 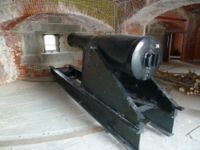 In the late 1890s, coastal defenses were again updated and Fort Delaware had five Endicott Period gun batteries built, the largest being Battery Torbert with 3 - 12" disappearing carriage guns. 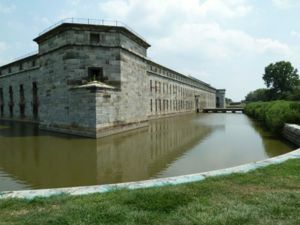 Three of the larger caliber batteries were built into the casemates of the old fort and two of the smaller caliber batteries were built outside the moat of the old fort. Three Endicott Period batteries (Battery Dodd, Battery Alburtis, Battery Allen) had their guns removed and shipped away during or just after World War I. By the 1940s all of the remaining armament on Fort Delaware was considered obsolete because it was outranged and slow firing. The batteries themselves were also obsolete because they were unprotected from high trajectory shelling and aircraft. The three 12" guns of Battery Torbert were shipped to Battery Reed in Puerto Rico late in 1940. The two 3" guns of Battery Hentig were shipped to Fort Miles early in 1942, leaving Fort Delaware stripped of all Endicott Period armament. The fort was finally deactivated in 1944. A Delaware State Park. The old Third System fort is restored and open to the public. 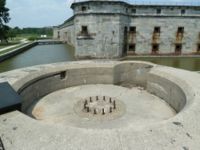 The Endicott Period gun batteries are considered unsafe and not generally open to the public. 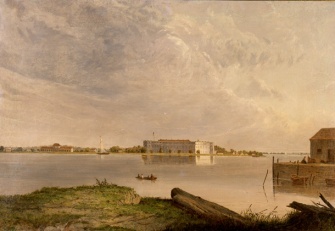 The fort is reached by a small ferry. Civil war period guns and mounts are displayed but no Endicott Period guns or mounts are in place. Location: Pea Patch Island, New Castle County, in the Delaware River. This page was last modified 10:05, 16 April 2019 by John Stanton. Based on work by Bill Thayer.